John Wong is working on bringing the Queens Night Market to Flushing Meadows by April. CORONA — A popular night market at Flushing Meadows-Corona Park has launched another fundraiser, this time to help keep its global food tents open. 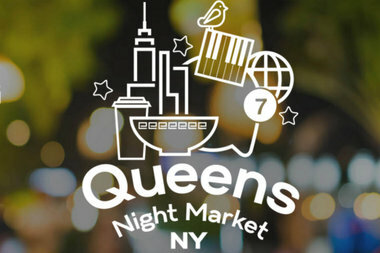 The Queens International Night Market opened in April in the parking lot of NYSCI despite its original Kickstarter not meeting its goal, organizer John Wang said. He "scrambled" to raise private funds to launch the event, which he dreamed could be like the various markets he's visited around the world. More than 30,000 people have enjoyed the global food carts and tents on six Saturday nights at the market, with food that included Burmese noodles, Trinidadian shark sandwiches, Peruvian steak sandwiches and salteñas. But in order to keep it open they'll need to raise $50,000 through a new Kickstarter, which ends June 30. "Markets can serve as gateways to different cultures, and one with diverse participation can be an accessible bridge for cultural exchange," Wang wrote on the new Kickstarter page. Backers will receive rewards including free food vouchers and T-shirts. He's also hosting a fundraiser at LIC Bar on Saturday, June 13 from 5 to 10 p.m. The nightmarket will take off the rest of June and is expected to reopen by July — continuing to keep it free for guests and affordable for vendors, he said.